“Fantastic Four” is perhaps this summer’s most frustrating movie. Films that are consistently terrible are generally not frustrating, because they rarely show any potential beyond what they are. But that’s not the case with co-writer/director Josh Trank’s “Fantastic Four,” a movie full of potential that it’s not allowed to deliver upon. Years after director Tim Story’s bland take on the superhero team, the filmmaker behind 2012’s “Chronicle” gives us a grounded vision of the Marvel heroes. 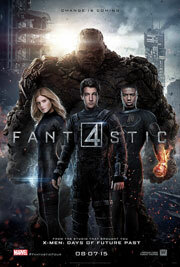 The players – Reed Richards (Miles Teller), Susan Storm (Kate Mara), Johnny Storm (Michael B. Jordan) and Ben Grimm (Jamie Bell) – remain the same, except they’re much younger and, at the start of the film, aren’t very close, with the exception of Ben and Reed. Ever since Reed was a little kid, he showed signs of genius, but that genius was always misunderstood. The only person who truly gets him is Ben, who supports his dream of teleportation. One day, Reed’s teleporting device is noticed by Susan and Johnny’s father, Dr. Storm (Reg E. Cathey), at a science fair, which lands him a spot at the Baxter Building, a place for brilliant minds. Dr. Storm has been trying to crack interdimensional travel for years, and he uncovers the final piece of the puzzle in Reed. With the help of Susan, Johnny and the brilliant by cold Victor Von Doom (Toby Kebbell), Reed gets the job done, but unfortunately, the government doesn’t want to send a bunch of kids to another dimension. While drunk one night, the young scientists (along with Ben) suit up and transport themselves to that other dimension, which leads to disastrous results.